When we consider the Sacrament of Baptism, two things become readily apparent. The first is how important baptism is in the Scriptures. Out of all the sacraments, none are foretold more than the sacrament of Baptism. (See Gen 1:2, Ez 36:25, 2 Kings 5:10-15, Is 1:16 to name but a few examples.) The other is that in our own lives, we all too often give far too little importance to this sacrament. We typically treat the sacrament as a past event with little importance in our current life. We should compare this attitude to that of saints like St. Louis De Montfort, whose “Total Consecration to Mary” devotion was viewed as the perfect way to renew and live out our baptismal vows every year. Why did the saints hold baptism in such high regard? To understand this we must ponder the purpose of water in nature. For men, water is meant to sustain us and provide life. We use water to cleanse our bodies and to nourish them. We use it to grow the food we eat, and we relax in pools of water. Simply put, water is essential to our lives. Water was one of the most important natural gifts that God provided us. Looking at water this way should stir in our minds a feeling of utter dependence upon God. This is the natural inclination baptism is meant to provoke within our souls. When we are baptized, a confession is made (either by ourselves or by our godparents on our behalf) of a total dependence on God for all things in life. This aspect of baptism is typically overlooked, as we tend to view baptism today as a simple initiation ceremony. Yet Solomon teaches us that “the fear of the Lord is the beginning of all Wisdom.” In Psalm 5, “fear” is clearly in the context of complete and total dependence upon God. This is what the author of Proverbs has in mind when he brings up fear. If we do not recognize our complete and utter reliance on God, our baptism means little. This sentiment is also of paramount importance for the next truth about baptism, and one I would like to offer by an analogy I am currently experiencing in my life. As readers may or may not know, at this time I am currently engaged to be married. My proposal was a sign that I view my betrothed an essential part of my life, whose love I count on to sustain me in my every day dealings of my life. Most importantly, I pledge to leave my old life behind on the day we wed, and promise that she is to be the focus of my life. While all analogies have limits (something I cannot stress enough! ), a similar situation could be described in baptism. When we come to the baptismal font, one could very well call it an “engagement” between us and Christ. We acknowledge our dependence upon Him and look towards Him to sustain us in all our activities. While this might sound like a modern interpretation, this is actually a very ancient one. As important as this aspect of baptism is, we cannot stop there. When a man proposes to a woman, he promises in a very real sense to leave his life behind and cling to his soon to be spouse. 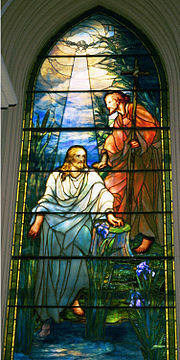 (Genesis 2:24) We do this in baptism by being baptized into the death of Christ so that we may rise glorified as He did. (Romans 6:3-4) At this point we begin that process of slowly but surely renouncing the sinful things of this world and embracing all that is good which comes from God. No union with God starts out with this level of perfection. The book of Hosea was written in the Old Testament to demonstrate this point with some of the most moving imagery in the Bible. To help in this process, there are numerous parts of the baptismal ritual (some of them still valid but merely optional) that help make this statement of self-denial a reality. To name just one example, blessed salt is placed in the mouth of the person to be baptized. To those who do not know the Old Testament, this can seem curious, but it is a ritual of great importance. The Prophet Elisha used salt to purify the Jordan River (2 Kings 2:19-22), which was then able to heal Naaman the Syrian. (2 Kings 5:10-14) Likewise the salt signifies our cleansing in baptism, and how after that cleansing, our faith and good works are enabled to provide sanctification and help us to grow in the life of Christ, which is holiness. This is the purpose of baptism, and I would venture that if we looked at it from this perspective, the promises made in baptism would be far more potent and seem far more relevant to our daily lives.